Ever wondered how the traditional forms learned in your martial art are applied in the real world? This digital video will help you make the connection between your traditional forms, applied techniques and realistic self-defence applications. 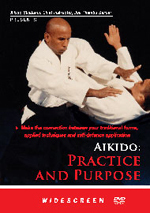 With Practice & Purpose being the focus, each of ten techniques is demonstrated multiple times in traditional form (Kihon waza), applied form (oyo waza) and self defence form (goshin jutsu). Whatever your martial arts background, this production will help you learn to bridge the gap in applying textbook knowledge to real life situations.